It was awfully hard to get up on Easter Sunday morning. The previous night, FameThrowa and Mr. Chatty had come over for dinner. There was too much pie (is there such a thing? ), too much wine (definitely a thing). The four of us were up late, filling and hiding little plastic eggs full of toonies, LEGO men, stickers and jellybeans. Then, although we swore we were going to bed, Sir Monkeypants and I stayed up even later after our guests had gone, drawn in by the allure of just one more Game of Thrones episode. We’d only been asleep about an hour and a half when the Captain came into our room in obvious distress. He couldn’t breathe – really, really couldn’t breathe. We were up and out of bed in less than a second, racing to the bathroom, trying to administer his puffer. We went outside – cold air helps the asthma – and I talked to him soothingly, trying to calm him, strugging to get in a puff or two of ventolin, while Sir Monkeypants pulled on jeans and threw a few things in a bag. All went well at the hospital – we know the drill. Some steroids, a face mask, and they were back home by 4:30 a.m. It took some time after that for our hearts to stop pounding. When the Little Miss got up at 6:30 to see if the Easter Bunny had arrived, it was quite a groaner. I’m too far past the baby stage to be used to counting up my total sleep by assembling a handful of one-hour chunks. But we did get up, and found eggs, and delighted in having candy before breakfast. Lego men made cute little voices and stickers were traded. The Little Miss reminded me over breakfast – for the 10th time that weekend, at least – that I’d promised to take her to the farm on Easter morning. The farm is the Canada Museum of Agriculture and Food, a working farm inside the city limits. For years I forced the kids to go on Easter, because I love the baby animals – who doesn’t love baby animals? But the older two hated it – the smells, the scary beasts, the wheezing and allergies. My youngest though, she’s an animal lover too, and she loves the farm – I finally got one! She wanted to see the animals, and it was Easter, and it had been far too long since we were there last. Despite my desperate need for a nap, I just couldn’t say no. So the two of us piled in the car and headed over. We touched a newborn lamb, stroked the world’s softest bunny, listened to the chicks go peep-peep-peep. We coloured as much as we wanted – no pressure to move on, it’s just the two of us – and found three hidden eggs in the barns that were traded for chocolate. 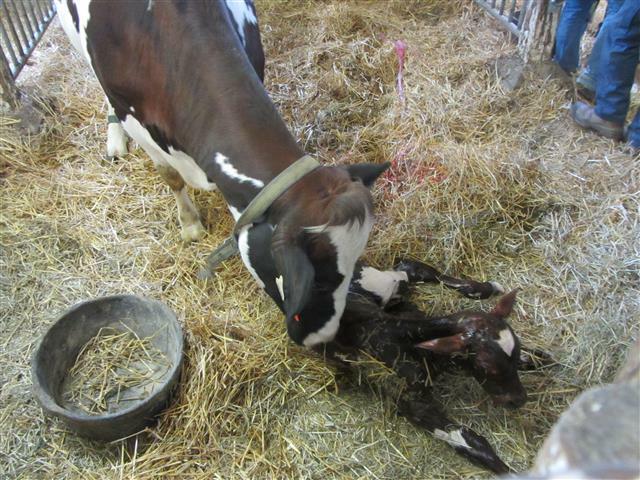 In the cow barn, we saw two calves – one two days old, one just over a day old. In the third pen in the nursery was a mother cow who was two days overdue. The Little Miss was very curious, but I warned her that although the birth would be soon, it was unlikely to be in the next 10 minutes. We moved on, went outside for a snack, couldn’t wait any more to eat those hard-earned chocolate pieces. It was time to go. I needed to fill a prescription for more steroids for the Captain, and was hoping to get in a little more work on the basement floor. But the Little Miss was dragging her feet. We’d been to all the barns, but she still just didn’t feel like leaving. It has been so long since we were here, she said. It’s such a nice day, she said. Just a little longer, she said. I told her that we really had to go but if she wanted to pick just one favourite animal to see for a second time, one animal to go and say goodbye to, we could do that. So she picked out the expectant mother cow, Evangeline. We hiked all the way back out to the cow barn and she climbed up the gate to Evangeline’s pen, hanging off of it along with two other kids who were having a look. I told her to smile – unfortunately Evangeline’s backside was facing us but figured it’d make a good enough photo. I pulled out the camera and just as I clicked it I noticed something odd. A small, white, fluid-filled bulge coming out her back end. Oh yes, there was active labour going on. As soon as the Little Miss heard that, there was absolutely no leaving. We spent the next hour in front of Evangeline’s pen. The crowd behind us grew and grew, but my daughter didn’t budge – it was as if her own baby cow was on the way. She gently asked questions – luckily we have already shared the just-the-facts-ma’am version of how babies are made – and we quietly and respectfully watched a baby calf being born. From start to finish. In less than 12 hours I went from fear, adrenaline, and the real threat of losing a kid, to innocent child-like pastel-coloured delights, to a powerful, rare, wonderfully beautiful moment that showed me that life goes on. Spring has sprung, and there’s new hope, and new life, and the dream of health. There is wonder in this world, and I felt so very, very lucky to have seen it from a front row seat. that’s why we get out of bed every morning.. tired or not 🙂 love this post! hope your son is feeling better. Amazing. This post sums it up – and Sarah did too – exactly why we get up and out there and push through the scary, sad moments: the rewards of the wonderful moments. Great post. Amazing. I love having that museum in the middle of the city. Wow – what a night and day you had. I think it sums up what it means to be a parent. From the moment of hearing that first tiny heartbeat inside of you, you begin wearing your own heart on the outside and it beats for the good, the frightening, and the miraculous and with kids, our eyes are open to all of those things all the time. what an incredible experience. so glad that little miss decided on evangeline to say goodbye to. GAH, LYNN! First the fig tree episode of the Vinyl Cafe was playing on my car radio today, then the season finale of Parenthood, and now this. I’m DROWNING. What an awesome experience! Great story – thanks for sharing.